Hm... didn't start this thread for this year? Well, this morning, I heard the tweeting whistle of finches in great excitement and picked up the binocs to look around -- almost by intent, a male goldfinch made a dramatic, swooping entrance into my field of vision. He landed on the dried up flower stalks of the yucca (which I need to remove but the birds find them so handy for perching) so I watched to see what he would do next. To my surprise, he hopped/flew to the honeysuckle gate arbor, full of flowerbuds and just starting to bloom. I had noticed that the annual infestation of aphids had begun on the honeysuckle. I never do anything about it anymore, because they attract the proper predators -- most notably the early ladybugs. But it turns out that the goldfinches love to feast on the banquet of aphids as well. Good to know! Most birds that are seed eaters most of the time, eat insects when they are feeding their young. So mister goldfinch may have a nest near by. My goldfinches are golden already and we've had hummingbirds at our feeders for a few weeks. I think you are spot-on because I just saw that House Finches have joined the banquet. They had their fledged babies with them, so even MORE raucous excitement, and the adults would gather up beakfuls (they plucked infested honeysuckle buds and flowers as they did this -- explains where all the dropped blossoms were coming from) then fly over to the 4 little ones perched shoulder to shoulder on the mulberry. Things that are different here from Cincinnati: Eastern bluebirds!! They nest in our next door neighbors nest boxes, but are in our yard a lot. So beautiful! As a trade-off, I have not seen blue jays, which we had plenty of in Cincy. Mockingbird was an occasional visitor to us in Cincy and is here all the time. Rufus sided towhee is around frequently and brown thrasher. The brown thrasher I only ever saw once in Cincy and the towhee was in the woods but not in our yard. The rest is pretty much the same, the finches and cardinals and chickadees. Hmm now that I think about it, not sure I have seen nuthatches or juncos here yet. Oh how fun to make those comparisons between your previous house and here! I wish we got Easter Bluebirds here -- I hear they used to be more numerous when the county road my development is on used to be lined with horse farms. Just about all have been turned into housing developments now. Speaking of the Chickadees, they are doing their own part to contribute to the Garden Patrol duties and feeding their babies -- the Princess Holly in the foundation bed under the front windows have scale insects on them, but the Chickadees are busy every day scraping them off while making a lot of chittering noises, occasional bursts of "DEE DEE!"... and hopping from one branch to the next, side stepping and swinging around to the underside, etc. Also adding great entertainment value for our kitties who love to sit at those windows whether the windows are open or shut. I went outside and planted a few tomatoes, sowing radish, carrots, planting onions, even sowing some cucumbers though I know it's way early. I was basically done but was reluctant to go inside so was putting around when I saw a flash of movement in the corner of my eye. I turned and tried to focus, but couldn't see anything... then a little twitch revealed something tiny ...took a moment to realize there was a hummingbird perched on the tip of a bamboo stake. I couldn't see clearly because the bird was silhouetted against the bright overcast sky, but there might have been a red gorgette We only get the Ruby Throated here and male sightings are even rarer, but it might have been a male -- usually the first-arrivals. How sweet! I feel like the hummers are always zipping around and I never catch them perching like that, besides at our feeder now and then. Our male ruby throats have been zipping around my garden for a while now. The other day one of my neighbors was over to exchange some plants we'd dug up for each other and she saw one zipping around my honeysuckle. She said she's never seen one in her garden! It made me happy that I seem to have planted the right things to attract them because they add such energy to my garden. I had never heard that finches would eat aphids! Very cool. I'm right with you applestar that I've pretty much given up on trying to control the aphids on my honeysuckle. Every now and then I'll squish some when I'm walking by, but mostly just let my garden patrol feast away. I would love if my finches would snack on them as well though! Oh and as far as nests go I have a wren nest in my birdhouse and discovered a cardinal nest in my schip laurel as I was pruning it. I got halfway through pruning before I discovered it and then stopped so it would still have some protection and coverage. It had 2 eggs at first, then eventually 5 and mom was laying on them diligently for a few days... then no mom and only 1 egg. Then no eggs I have no idea what happened and I'm devastated! I'm not sure if it's okay for me to finish pruning at this point (it looks pretty wonky) or if I should give her a chance for another brood in that nest? I was bent over pruning and weeding when I heard a flurry of buzzing. At first I thought it was hornets or something so I ducked, but then realized I knew that sound... hummingbirds! I turned to see them and realized they were getting busy. They perched momentarily on a branch just above me, things happened very quickly and seemingly aggressively, and then the female took off with the male all ruffled and in hot pursuit. I guess they must have a nest somewhere nearby? Do they usually do the deed after they've already established a nest? I guess the females have made their migratory journey up here! Last edited by pinksand on Tue May 23, 2017 8:48 pm, edited 1 time in total. LOVE watching the busy chickadee parents from my upstairs window. The chicks are getting louder when they go in the birdhouse. Usually something tiny in their beaks, but today, saw something big and puffy, white. I think one of those big ground spiders carrying her egg sac. I wonder if even that is for only one chick? -- someone got lucky. I still see them occasionally scraping up aphids from the nearby honeysuckle -- I don't know if that's for quick energy snack or easy-pickin's when they are tired of winging their way across the yard or street in search of baby food. The House Wren in the birdhouse two fence posts over has been louder and sounding more possessive. I think he managed to entice a mate to accept "this" house. It's been several days, maybe a week ago, when he was still calling and trying to attract a lady-love, there was a loud outraged chickadee cursing and flurry of wings from the Chickadee's birdhouse to the the Arrowwood Viburnum, then wings hitting branches as tiny bodies went into crazy flight chase inside the shrubbery, then the House Wren streaked out with a Chickadee in hot pursuit. I suspect the House Wren forgot himself and peeked into the Chickadee's house, thinking he should decorate that one, too. One of the baby robins in the blackberry gate arbor jumped out of the nest when I was closing the gate. Later, I heard the distinct chirping by the back door -- all the way around the house -- a mole who usually hugs the house foundation along the patio RAN across the middle of the patio... and I saw the baby Robin hopping and chirping along the corner of the patio. I don't know if it followed ME or it just happened to come around the house. I hope the mama bird can find it and feed it. But I will have to be extra careful going in and out of the back door so our indoor kitties don't try to dash out. One of them is already glued to the kitchen window overlooking the patio. I have several buckets that are strategically placed to hold water -- one is at a corner of the picnic table, one catches overflow from a rain barrel, for emptying catch tray water, one bucket that is permanently connected as remote reservoir to a SIP, etc. during the summer, I put feeder goldfish in these to control mosquitoes. Last fall, I was emptying most of them to put away, but one bucket so emptied ended up with goldfish flopping in the grass -- quickly captured and tossed into another, fortunately larger, bucket. After that I had to consolidate. As sometimes happens, some of the fish had died over the winter due to the buckets freezing solid. Two buckets cracked and had leaked out. One bucket cracked in the side in such a way that bottom of the crack was two inches above the bottom. There was a surviving goldfish in that bottom two inches of water. Sometimes, they make it through the winter, but somehow die in spring. Since we had some heat waves, I have been checking the buckets and any water holding vessels to monitor for mosquitoes, and have been adding mosquito bits when mosquito egg-rafts and larvae appeared. Several of the overwintered buckets NEVER developed mosquito-signs. One bucket had gone down to inch or less of water -- no way there's fish in there right? But I saw an orange goldfish swim up one day out of the murky water after the ice melted and buckets filled up with rain water. The big 10 gal bucket at the corner of the picnic table -- I have been monitoring carefully and I'm at the table constantly because this is where I harden off my seedlings and wintered-indoor plants. Yet it was only yesterday that I FINALLY saw a brown fish -- goldfish? minnow? -- come swimming up to the surface. I'm going to need to station more buckets as gardening season enters full swing. Time to go buy more feeder goldfish! So I was looking out of the window to admire my handiwork A Robin skipping around eye-ing and listening to the ground for worm signs was no surprise. A housefinch couple was not so common visitor, but I did see a goldfinch earlier, too, so I assumed there were some kind of seeds that have ripened. What I couldn't quite see was what they were doing in the SFH swale... maybe the seeds had floated up and settled along the edge after the water soaked in? But then I noticed a cardinal male and a female, and Chickadees -- presumably a male and female -- fluttering around the Spiral Garden and the SFHX in apparent excitement. Initially I thought they were finding tasty treats from all the digging I did, just like the robins, then watched the male cardinal apparently taking a bath in the SFHX swale. Closer view with binoculars revealed that a chickadee had already taken his/her bath and now the cardinal was taking his time to get a thorough soak -- but they were bathing in the silty puddle in the swale that still hadn't soaked in after 4 hours due to my scraping away all the topsoil down to the clay subsoil. As I watched, the cardinal was getting muddier and muddier, but looking quite satisfied, dunking his head in the stirred up opaque water, and the chickadee was edging back for another mudding soak. Apparently, I have opened a specialty spa for the birds and didn't realize it. I wonder this is like a wet version of a dust bath and good for getting rid of feather lice, etc.? Applestar that is hilarious! I've never seen birds bathe in mud before, nor a muddy bird in general! The waterer/bath I purchased has been really popular with the birds and the squirrels like to take drinks from it. I didn't even realize but it can either hang or fits snugly over a 4x4 fence post so it's perfect for the birds to perch along the fence and take turns. My cardinals never returned to their raided nest, but the wrens made it and left the nest a couple weeks ago! I'm missing them now though because the garden is so quiet without mom and dad yelling at me and without the babies cheeping endlessly for food. I feel like those poor parents were coming back with bugs for the babies at least every 5 minutes... that's a lot of work! I've had lots of hummingbird visitors at my window feeder and salvia on my railing planters, which is where I'm able to see them the best. This has been my absolute best year for butterfly weed! Every other year I've been plagued with orange aphids around this time, but this year the plants have been left alone and are glorious! What isn't so glorious is my poor rose mallow that's being devoured by hibiscus sawfly larvae! Omg, they are the worst! Once I was able to ID them, I went out daily and squished or drowned as many as I could see. I released lady bugs the other night but I think it looked like the larvae had turned into their fly form already so it was probably bad timing. I definitely have a bunny nest somewhere in my garden...which I have mixed feelings about. My dog got to one of them, but they've been super lucky since then. This morning the cutest little wiggle nose was out there eating clovers and my dog was freaking out at the door. The bunny was unphased and just kept munching away. As long as they stick to clover I'm fine with them taking residence in my garden... they're just so precious! I watched from an upstairs window as one of the Wrens swooped into my hanging basket tomato plant. I was a little annoyed thinking it was probably after spiders -- said to be their favorite food -- especially since one of the plant's biggest branches got broken the other day -- from the storm winds I had thought... then the next instant, the bird TRIUMPHANTLY -- yes absolutely I could tell -- swooped out and landed on a green fencepost, dangling a long green caterpillar! Way to go, bird! But there was no cat, and the Wren was intently looking down from a high perch at the ground below into the wildblueberry and strawberry patch (is it the snake?) ...THEN a small chipmunk ventured out into the lawn/short grass -- AND THE WREN DOVE AT IT. It looked like it landed more than one strike with its little beaks I have never seen this behavior before. But as if to confirm, later I saw -- most likely the same chipmunk -- hurry across a grassy area between one cover to the next, and a Wren came out of nowhere and chased it across the patio. There had been some cringing and ducking going on around the house since a couple of days ago -- a wasp had somehow gotten in. No one wanted to try to catch i, especially since we thought it was a Paper Wasp from a nest being built in the porch light. This morning, however, the wasp flew to the window where I was sorting some seeds to sow, and landed on the windowsill as if asking to be let out. 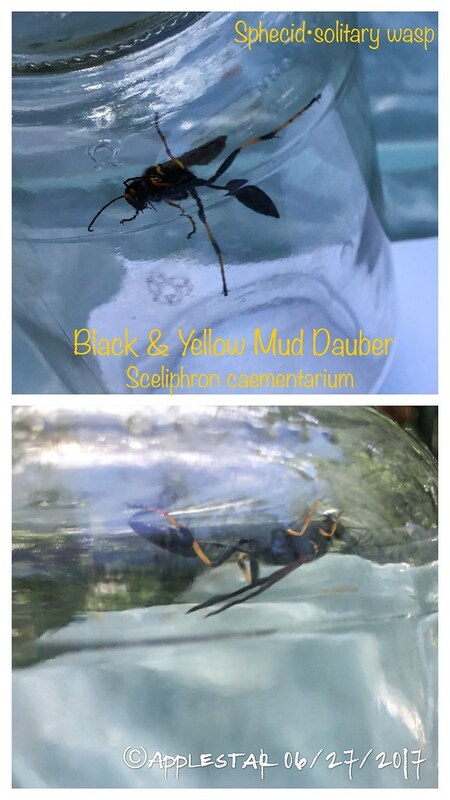 It turned out to be a mud dauber. I'm glad I was able to let it back outside. The wife pointed out yesterday that the butterflies had dramatically increased since we moved in 11 years ago.